If it seems like there’s a lot of new faces in classrooms this semester, you’re right. Eight new full-time faculty members began teaching at NMC this fall, more than double the number of new faculty who started in 2014 and 2013. Among those eight, Mac Beeker stands out for another reason: He’s the first full-time male nursing instructor in department history. And with NMC’s male nursing enrollment well ahead of national averages, he’s a fitting addition to the faculty. NMC’s associate degree nursing program enrollment is 21 percent male and male enrollment has climbed for the last two years, both in terms of actual students and percentages. National averages for male student nurse enrollment stand at around 15 percent. Among practicing nurses, only about 10 percent are men. Director of Nursing Laura Schmidt said NMC has had male adjuncts, but Beeker, a medical-surgical instructor, is a pioneer in terms of full-time status. “I think it’s very positive that there’s a male instructor,” said Brandon Thompson, a Traverse City nursing student. Graduating next spring, Beeker is the first male instructor he’s had. Beeker, 50, entered nursing after careers in radio and non-profit management. He came to the field at 40, “half-accidentally, half intentionally” after his parents got sick. In terms of their hands-on care, Beeker discovered that nurses were the providers who truly made a difference. “My own involvement with my parents’ health, it was pretty clear to me,” he said. As Beeker did, many men find their way into nursing at older ages and after caregiving experiences, often as a parent or for a parent. Beeker said he’s particularly interested in infusing a human connection to the practice of nursing. 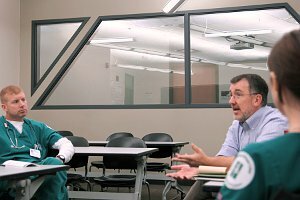 When teaching a procedure, for instance, he seeks for students to learn not only how and when to perform it, but to conduct it with care and compassion for the patient. 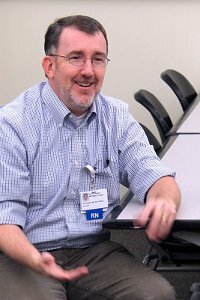 Skill grounded in academic knowledge delivered in a compassionate bedside manner equates to “phenomenal” nursing, he said. “I felt that was very present in the NMC program, and I want to continue to try and develop that,” he said. Since graduating, Beeker has earned a master’s in nursing and worked as a medical-surgical nurse providing primarily post-trauma care at Munson Medical Center. He plans to maintain that connection, working a few on-call shifts a month, to keep up his skills. He said Munson’s status as a magnet hospital for nursing, a designation of excellence by the American Nurse Credentialing Center, reflects positively on the quality of NMC’s program. “That trickles back and is fueled by the NMC program,” he said.